$ DayRate the skein of 10 grammes (around 122.5 yards). The sheep is one the first animals to to have been domesticated by the man. One finds its more ancient trace in Iraq (8 000 BC). Testimonies and texts engraved in the stone or on tablets of clay, vestiges found during archaeological excavations suggest that wools and goats or camel hair have without doubt been the first fibers worked. This hypothesis was reinforced by researches led in Mesopotamia, to the middle east and in central Asia. Stems containing bast fibers, as the linen, the hemp or the jute, are known since Antiquity. The wool is the fiber that it is the most formerly used for the realization of tapestries. Five centuries before Jesus-Christ Homer already transformed it into a fleece of gold and did Penelope working with. The sheep was the "official" animal of the rural life and also a major element of the ancient economy. Its wool fed a powerful industry. The work of the wool has to Aubusson stayed an artisanal activity, exerted on a small scale by qualified artisans, the spinners and dyers , regrouped in family enterprises. From the brute matter , told wool in suint, to its final use on your Tapestry , the wool bear many and precious transformations. The wool is a supportably matter that can be dyed esealy. It preserves its freshness colors through the time. This is why Tapestries , no matter that they came from Flanders, Aubusson , Felletin, Beauvais, Gobelins or be done by "Petit Point have always used the wool as main raw material. Qualities of the wool allow its classification, by fineness, by style, some are well white others yellower, or more brittle, there are finer wools and others coarser; with each one do not do the same thing. More the wool is fine, more one will obtain threads. The wool used to Aubusson is a wool of Merino. It is a wool twisted or wavy, sometimes curled, sweet, elastic, fine. A lot less length than others, approximately eight centimeters, but far more dense and whose one makes fine threads. Very fine wools are understood between 15 and 18 microns, fine wools between 18 and 23 microns, coarse wools between 23 and 40 microns. The wool used to Aubusson is a fine wool . The washing of the wool.The water in the process of elaboration of yours needlepoint wools is of course a capital element. The power of the water has long been energy used to actuate all wheel sorts. Flour mills, textiles manufactures, have been therefore all naturally implanted to brooks and rivers banks. The strong slopes where flow rivers throwing in Creuse river itself have favored to Aubusson , Felletin and around, many implantations of manufactures and different textiles activities. In the "Aubussonaise" area the hydraulic force "Auget wheel" was still until years 1950 energy providing. To wash the wool, it is necessary first to do an "ouvraison", (opening step); the wool across in a machine with large teeth that "opens it", ventilates it and put down heaviest impurities. Then one soaks the wool in a hot and soapy water vat so as to dissolve the grease and impurities while some vegetable wastes remain hung to fibers. A lamination between two rolls, then a rinsing to the running Creuse's water , which reputes particularly pure , end this step. Before the drying, one wrings the wool. After washing, the wool loses half of its weight (hundred kilograms brute wool gives approximately fifty kilograms washed wool). Geting out pigmentation. This process consists in pulling out natural colored pigments of the fiber so as to obtain from the dark matter such that the gray, brown, black, then practically white nuances without attacking the fiber and without the loss of the "touch", what is very important with specialized fibers as those destined for the Tapestry and Aubusson like or others Needlepoint . Carding The wool look now in the padding aspect. To disentangle fibers, the wool is carded by passing in the great bristled pins rolls increasingly thin to obtain a flat mattress of wool. One can make this operation manually with the help of small brush to card. The combing step It is the aristocracy of the wool's work ! This operation serves to arrange in parallel order the totality of fibers, to eliminate all short fibers ("blousses") and the vegetable matter remaining. The wool is now ready to be spun. To Spin The Spining is one of the oldest form of the human civilization. 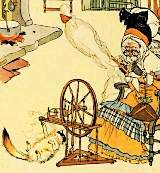 During millennia, on all the world (and again today in some countries) one has used the spindle. In "Creuse " area and in central region of the French country ("Massif Central ") in general, one finds many spindle tools in dated archaeological excavations of the Neolithic (-2500 BC.) (Orgnac and Soyons museums). One finds some similar equally on Egyptian frescoes in dated excavations of the Roma period or even medieval. The Dyeing. This were Phoenicians that spread in Europe the different dyes used in the Middle East. Pline the Ancient (23 to 79 after J.C.), speaks at length of colors in its "Historia Naturalis". As the centuries go by, Orient to Indias by passing by Florence and Americas, many dyes will be then discovered (sorrel, cochineal, pastel, indigo, lapis lazuli, etc.). Today the chemical colouring replaces increasingly the colouring from natural origin; They have the advantage of the resistance to the light and the almost unlimited range of all imaginable colors. Annie Bouquet have choose for its cardboards and for you an inimitable palette ! It is in "Creuse", to Felletin and to Aubusson , for an always brisk "Tapestry de France", that artisans fashions. . . . these wonderful colored wool threads.